I had meant to write about this the first time around, but having to stop a few weeks before the wedding never gave me an opportunity to blog about the journey so I’m rectifying that now. I’ve just completed the 6th week of T25, which is the same amount of weeks I’d completed the first time around. It’s also the 1st week of Alpha Round 2, as the program is technically only 5 weeks long, and I’m doing Alpha twice because I know I’m not ready to move on to Beta yet. Heck, I might need to do Alpha three times before I feel like my body can actually handle Beta, to be honest. On Saturday’s I always do an extra workout, because I don’t trust myself to take two days off, and that workout typically ends up being Tae-Bo Cardio, but in the 3rd or 4th week I thought I’d give Beta Cardio a shot and holy crap was it so much harder than I could have imagined. Now, I made it through it, and felt totally badass for it in the end, but it’s definitely not something I could do everyday yet and so I’ll stick with Alpha for another 4 weeks before I decide whether I’m ready for the upgrade yet. So how has it been, now vs. before? Interesting? That’s a bad answer. Challenging? Yeah, that’s better. And challenging is good, because growing bored in this certainly wouldn’t keep me motivated. I must admit, though, that some weeks have been harder than others. In week 1, making it a habit again was difficult. I found myself barely making it home in time to swallow some dinner, workout way too late, shower, and head to bed before midnight. For someone who gets up between 4 and 5 AM everyday for work, this is too little sleep. It left zero time for anything else, stressed me out, and left me constantly tired in a dangerous way. 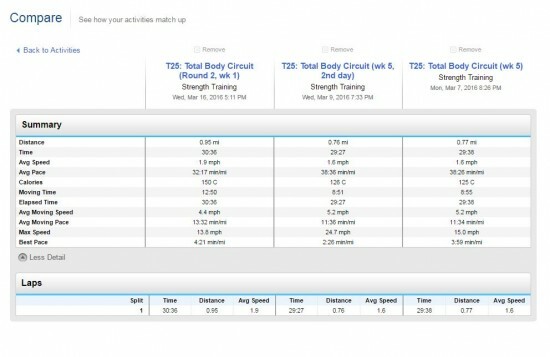 The best thing about week 1 was being able to actually do the recommended 2 workouts on Friday. I couldn’t do 2 in one day until week 4 the first time! 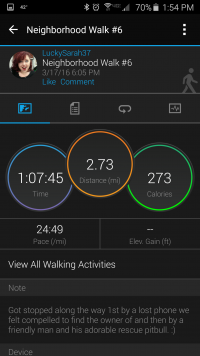 In week 2, that tiredness in week 1 caught up with me and my workouts suffered for it. Where I should have been able to give them a little more oomph, I was giving them a little less because I just didn’t have the energy. But, the habit felt formed already, like something I couldn’t skip – something my body needed – something I must do! Even though my muscles ached, I’d started to crave the pain because it reminded me I was doing something right. By week 3, my priorities surrounding my schedule started to shift. Feeling like I must workout everyday forced me to make the most of the minutes in all the other things I do everyday. It also forced me to ax some non-priority activities like TV and social media from my everyday to-do list. If it couldn’t be done on my phone in a handful of minutes, it’d have to wait. I managed to make getting at least 7 hours of sleep a real thing and my muscles and mind were grateful for it. In week 4, frustration set in. When you physically push yourself hard 6 days a week, you expect to see significant or noticeable progress. And when you don’t, it’s so easy to just want to throw in the towel. For as much as I loved the aching of my muscles, I hated it too. I hate how much my knees crunch every time I go to stand up or squat down. I hate how old it makes me feel to move stiffly after being seated for too long. I hate how I have to take ibuprofen on leg intensive days just so my knees can even handle the workout. I hate standing on the scale and seeing the number either not move at all or even move up, when everything about your body feels tight and awesome until you step in front of a mirror and confirm that nope, you’re still giggly and fat. In week 4, my insecurities wanted me to just give up and stop wasting my time, but mentally I knew that wasn’t the answer. And I kept praying desperately for just the slightest evidence of progress, a 1/4″ even would have helped, but it hadn’t come. Thankfully, I didn’t quit and it was probably the sermon at church that week that kept me going. Things happen in God’s time, not ours – Pray for patience, not progress. In week 5, frustration turned into obsession. Truthfully, I’m surprised it took that long. I suppose the feeling of working out as a must was the beginnings of it, but fitness obsession was in full-blown effect by week 5 and it’s not going away anytime soon. At the start of this second attempt of T25, I’d sold the unopened Fitbit Flex I got for Christmas and got myself a Garmin VivoSmart band to track my steps and sleep activity. My husband and mom have older model Garmin bands and it’s made both of them revive their naturally sedentary lifestyles. I wanted to do the same, but I wanted more features so I went for the newer “smart” model and quickly became obsessed with it. It’s thin and unobtrusive on my wrist and it acts like or appears to just be a digital watch whenever you touch it, but swiping and pressurized touches will give you a whole series of other options like: how many steps you’ve taken for the day, how many you still need to hit your goal, how many calories you’ve burned, or how many miles you’ve walked today. It also does even cooler things like when you’ve been sitting still for an hour, it vibrates at you and tells you to move and won’t clear itself until you do it to it’s satisfaction. If you ignore it, it will continue to vibrate at you every 15 minutes until you’ve hit 2 hours. It takes a lot longer to clear it if you let it get to that far without listening. It also tracks activities, so whenever I do T25 (or any sort of “workout”), I tell it to track the activity and then when I’m finished it stores them all on the app so I can later compare the actives on a week to week basis to see how I’m improving. 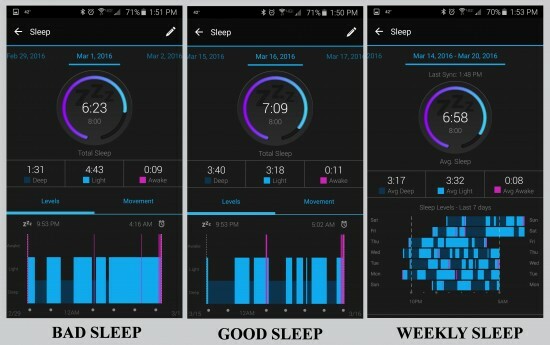 It can track an assortment of different types of activities and it breaks each of them down by your fastest pace, a graph of your movement, how many calories you burned, etc… The sleep tracker is one of my favorite features though because it not only tracks the hours you sleep, but your light vs. deep sleep hours too so you can tell which things might be making you get more or less of the different kinds of sleep (for instance, my sister discovered her lifelong habit of sleeping with the TV on was leaving her with very little deep sleep every night). It even knows when I’ve gotten up to pee in the middle of the night. And you can set a little alarm on it, so you wake up to a vibration instead of the jarring sound of a regular alarm. Lastly, it can sync so seamlessly with your phone that you could control music from it, if you were in the middle of a workout and wanted it louder or softer or just to change a song, and you can have notifications sent to it, of which you can actually even read right on the band! I currently have my phone calls, text messages, and emails linked to it and it’s extra convenient for knowing when I NEED to check one of those things right away or if I can wait a minute until I’m near my phone again. Looking back, that all sounds a bit advertise-y, but it’s just because I really do love it. So much so that my sister has also since gotten one and now my whole family competes against each other daily in steps. 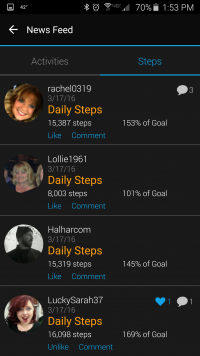 You can “friend” people on the app and set challenges or just see their general daily progress every time they sync. My sister and Heath are so competitive they will literally run in place for 10-20 minutes several times a day just to get more steps and there’s a ton of trash-talking in the daily comments; it’s quit funny really. Having a job that requires I actually SIT at my desk means that I don’t beat them often, but I have on a few occasions and it was such a victorious feeling! My best day so far was over 16K steps and since I’ve had the band, I’ve put in over 400,000 steps total! I’ve found myself so obsessed with the steps that I have a hard time sitting down for too long now. Heck, I delayed a whole week in writing this post because I didn’t want to sit at my desk long enough to write it when I could be stepping. You can imagine what that means for my reading. If I can’t read it while I’m walking around the house, I haven’t touched it (which means, I’ve basically only read comics these days). Even while I’m doing menial tasks like the dishes, I’m stepping or dancing in place as much as I can to get those steps in. I’ve joked that by this time next year, everyone will ask our family how we got so fit this year and our answer will be out stepping each other, but it could be true. I never thought I’d ever see us so motivated before and who knew we were so competitive?! Anyway, I rambled about all that because it’s feeding my fitness obsession right now and in week 5 signs of spring started to make an appearance outside so Heath and I started walking after my T25 workouts. At first it was just a mile or so, but since then we’ve wandered halfway through our town, walking up to 3 miles a day now in addition to T25! That’s like an additional 3-5K steps just for walking around for a half hour. We both signed up for the Color Run in May this year and while I know we’ll likely just be walking it since the kids are going with us, I’m excited that if we keep up this walking every night thing, we might actually do the Color Run (walk) without being winded at all. This past week, week 6, was a re-start of the program and you might think that since you’ve done it before and already made it past 5 weeks, that going back to the start wouldn’t be very challenging, but it is for a couple reasons. For starters, I can do a heck of a lot more now with the group than I could in week 1. I almost exclusively followed Tanya (the modifier) in those early days, and while I still need to for the high impact knee moves (primarily any that involve jumping), I’m otherwise doing everything else with the crew now. I’ve also been struggling with the tiredness again, but this time not of my own doing. Turns out that despite taking prescriptions for both of these things, my thyroid and vitamin D levels are back in dangerous places. I’m currently working with my doctor to rectify these things, but my week 6 routine definitely suffered for it. Hopefully it will be all sorted out before I hit week 8. Yesterday I did the stretch session for the first time since having T25 and I’m not sure why I waited so long to check it out. My muscles are in a constant achy state, even with Sunday being a rest day, but doing that stretch DVD after my Saturday workout yesterday not only settled my heart rate and mind to a calm place, my muscles also felt SO relieved for a change. They’re achy again today, which is to be expected since I murdered my legs yesterday, but I think that stretch session is crucial from here on out. In addition to this, I’m going to continue to up my step goal by 1K every two weeks and try one of Blogilates daily mini workouts for the month of April. With all of that, my T25 schedule, and neighborhood walks with Heath, I’m bound to be reporting even bigger progress the next time I blog about this journey. For now, I’ll leave with this… Anything worth having in life takes time and it’s important to track any and all of the things you want in life so you can later reflect on them in a better light than you might have had along the way. I’m on a mission to lose a significant amount of weight, on a journey to feel strong and be healthy enough to house a baby. Nothing about that will happen overnight. So, celebrate the progress, no matter how small or how long it took to happen, because it is happening. You are changing, little by little, for the better – just don’t give up!